Blur is an alternative rock band which formed in Colchester, England in 1989. 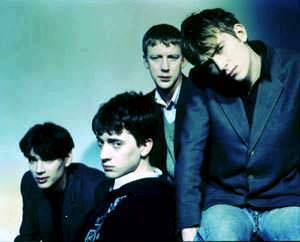 The band consists of Damon Albarn (vocals, guitar, keyboards), Graham Coxon (guitar, vocals), Alex James (bass) and Dave Rowntree (drums). Blur's debut album Leisure (1991) incorporated the sounds of Madchester and Shoegazing and spawned their first UK Top 10 single, There's No Other Way. Following a stylistic change in 1992 (influenced by English guitar groups such as The Kinks, The Beatles, The Animals and XTC) Blur released "Popscene" as a stand alone single... .